These smell and taste great. Moist and chewy. Doesn’t it sound really good to throw some stuff together in the evening, bake in the morning and have fresh artisan-style loaves? It does to me. Especially since there is only about two minutes of kneading. All that foam is from the beer. 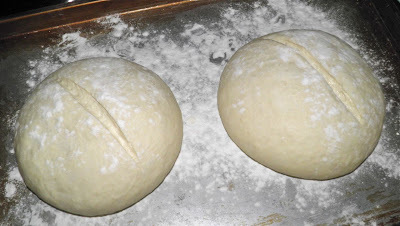 You could also mix the dough together before you leave for work and then serve warm, fresh bread for dinner. 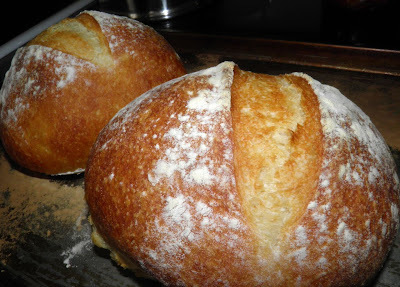 This recipe makes two beautiful small loaves that come out of the oven golden brown and yeasty. Yeastier (is that a word?) than most bread. It’s because of the beer. It’s almost like double-dosing the yeast. I know it’s a waste of a beer and a half, but the results are well worth the minimal sacrifice. This bread tastes terrific. And the recipe makes just enough to be devoured the same day at a family meal. Beer bread has been around for as long as there has been bread and beer. In the case of bread, Neolithic times. But it was unleavened. It is believed that yeast was first discovered as an ingredient in Egypt about 6,000 years ago. Beer came into being about the same time, interestingly. Knead only to bring the dough together, about 2 minutes. 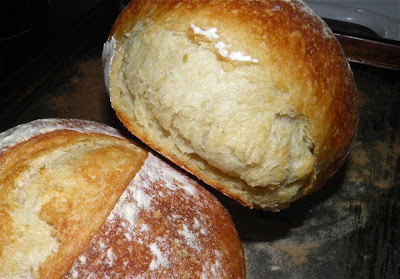 If you would like to read a little more about beer, bread and yeast (all together) go here. It’s a treasure trove of scintillating facts to wow and amaze acquaintances at cocktail parties. I would imagine some bored, or slightly inebriated, baker thought to themselves that a simple substitution would be a jolly good thing to try. This recipe for beer bread is jolly good, but it’s not a normal beer bread recipe. 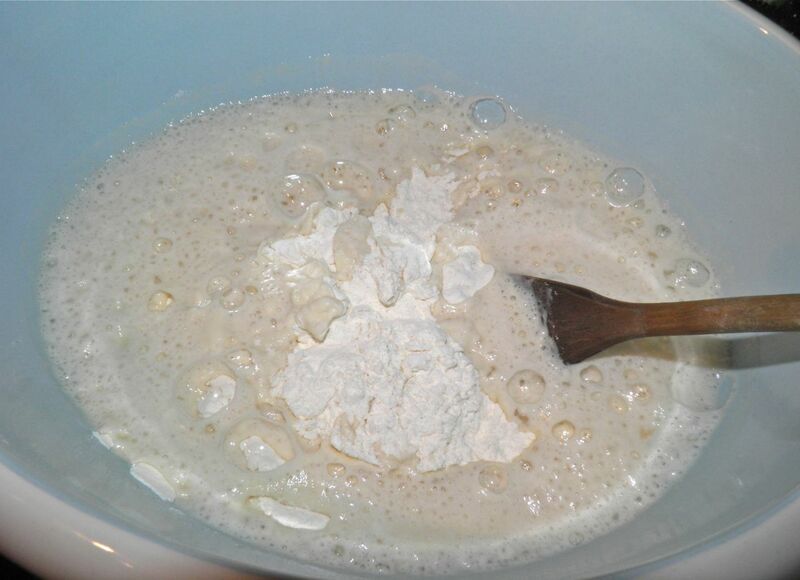 Many recipes just call for flour, beer and some sugar to kick start the process. Since much commercial beer has little live yeast the bread usually turns out fairly dense. I’ve used the beer as a flavouring agent as much as a leavener. To help it along I added more yeast. 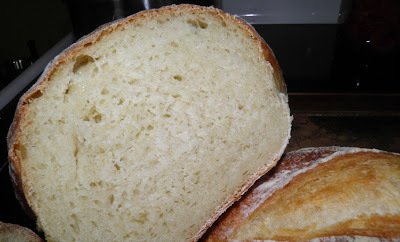 This make the bread quite moist and sweet, much like a good French or Italian loaf. No need for butter at all, really. This is what you find 12 hours later. Mix the flour, yeast and salt together in a large ceramic bowl. Pour the ale over the top and stir it in. 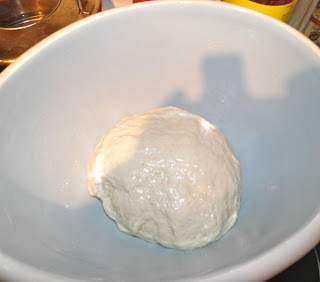 Once you have stirred it together as much as possible, knead the dough with your hands for 2-3 minutes until all is incorporated and the dough is fairly smooth. Oil the bowl and place the dough back in the bowl, turning to oil the top. Cover the bowl with plastic wrap and then a towel. 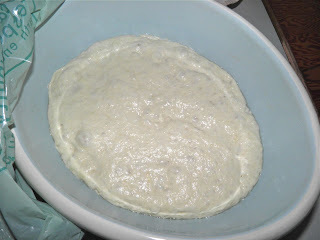 Let the dough rise overnight (at least 8 hours; 12 is better). In the morning divide the dough in half. Do not punch down. It will deflate on its own as you shape it. Form each piece into a round loaf by cupping your hand in under the dough to draw the top taut. 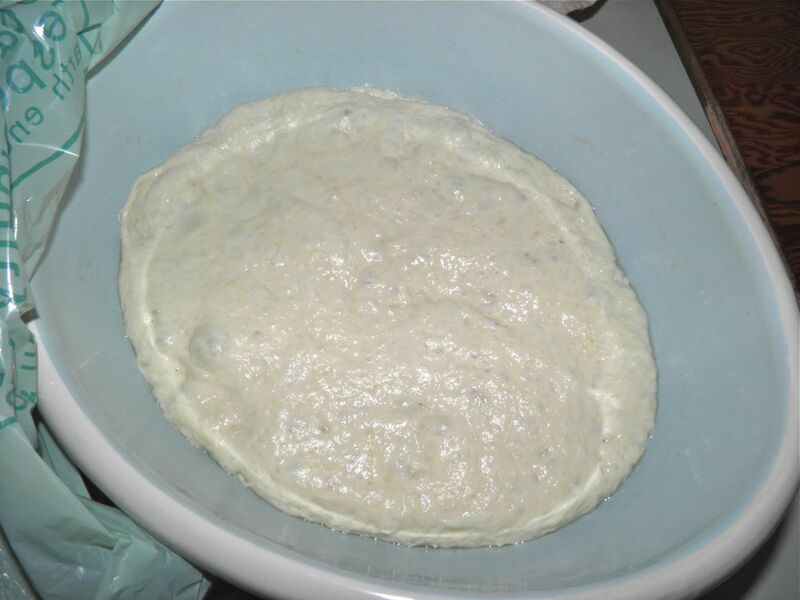 Turn the dough as you cup with your hands. Place on a floured baking sheet, dust the tops with flour, and let rest for one hour. Preheat the oven to 450°F with a pan of water sitting on the lowest rack. Just before baking, make one long slit across the top of each loaf with a razor blade. Place the bread in the oven and let bake for 30 minutes. Remove the water pan after the bread has been in the oven for 10 minutes. The loaves are done when nicely browned and they sound hollow when tapped on the bottom with your fingers. They will nearly double in size during baking. Let cool completely (or slightly if you can’t wait) before serving. * I used pale ale and unbleached flour so my bread turned out the colour of very light rye. There’s no rule that says you couldn’t use a porter, red ale, or a Guinness!